on that-the auspicious will of the divine-may my mind dwell. Maha Shivratri is a Hindu festival celebrated every year when chaturdashi tithi in the Krishna Paksha (waning moon) of the month of Maagha (Gujarat, Maharastra and South Indian Amavasyant system) or Phalguna (Purnimant Months system . North India) appears during the midnight which is not 00:00 AM. The midnight as per hindu calendar is (next sunrise . previous sunset)/2. As hindu day is from the sunrise to sunset. The festival is principally celebrated by offerings of Bael (Bilva) leaves to the Lord Shiva, all day fasting and an all night long vigil. 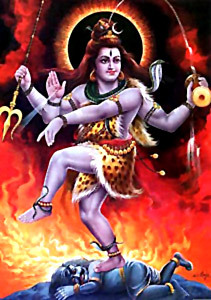 Shivratri (Sanskrit 'ratri' = night) is the night when he is said to have performed the Tandava Nritya or the dance of primordial creation, preservation and destruction. The festival is observed for one day and one night only. There are many legands related to mahashivaratri. It is a night of yogi. According to the Puranas, during the great mythical churning of the ocean called Samudra Manthan, a pot of poison emerged from the ocean. The gods and the demons were terrified as it could destroy the entire world. When they ran to Shiva for help, he in order to protect the world, drank the deadly poison but held it in his throat instead of swallowing it. This turned his throat blue, and since then he came to be known as 'Nilkantha', the blue-throated one. Shivratri celebrates this event by which Shiva saved the world. King Daksha, opposed Sati's marriage with Shiva. At a yagnya (holy sacrifice) the king ignored Shiva's presence and thereby insulted the latter publicly. Sati was so angered by this that she jumped into the sacrificial fire and ended her life. Lord Shiva unleashed his fury at the death of his wife by performing the violent dance, Taandav. He wiped out Dakshas's kingdom, undertook rigorous penance and retired to the Himalayas. The Gods, who feared that the severity of Shiva's penance might bring an end to the world, revived Sati in the new avatar of Parvati. Shiva-Parvati married and this reunion is celebrated on Maha Shivratri. he story of King Chirabhanu is narrated by Sri Bhishma in the Shanti Parva of Mahabharatha, detailing how he was given birth as a King for his fast during Shivarathri. King Chithrabhanu belongs to Ishvaku dynasty - whose lineage Lord Rama was borne. Chithrabhanu was dutifully observing a fast with his wife on the Maha Shivarathri day. The great sage Ashtavakra came to the court of the king. It was a Mahashivarathri day. The sage asked the King why he was observing a fast on this day. The King explained that he was blessed with remembering about his previous birth. The King narrated that in his previous Janma he was a hunter and his name was Sushwara. He was hunting and killing birds and animals, that too in Varanasi. One day on his routine, he was hunting for animals deep in to the forest, darkness fell and he was caught in the forest. He perched on a tree for shelter. It happened to be a Beal (Vilvam) tree. He killed a deer and hung upside down in the tree. He had no time to take it home, hunger and thirst struck him, he was kept awake throughout night as he was afraid sleeping on the tree would make him fall on the ground and he will become a prey to wild animals. In order not to sleep, he plugged the leaves of tree and put it on the ground. He thought of his family and cried as they too would be starving. Next day he returned home, bought food and gave some portion to strangers before consuming it. Years passed and his last day on earth came. Lord Shiva's two messengers came to take his soul away to the abode of Lord Shiva. Then he learnt that he earned this merit because of his pooja done unknowingly during Shivarathri day. The tears he shed thinking about his family's plight fell on Shivalingam down the tree. The leaves he dropped fell on the Shivalingam, he could not eat food as he got held up in forest became a pure fast, next day he distributed food to someone before consuming, thus breaking the fast in tradition. This earned him a berth in heaven and after sufficient delightful life at the abode of Lord, he was borne again as King Chitrabhanu. The legend of marriage of Shiva and Shakti is one the most important legends related to the festival of Mahashivaratri. The story tells us how Lord Shiva got married a second time to Shakti, his divine consort. According to legend of Shiva and Shakti, the day Lord Shiva got married to Parvati is celebrated as Shivaratri - the Night of Lord Shiva. Legend goes that once Lord Shiva and his wife Sati or Shakti were returning from sage Agastya.s ashram after listening to Ram Katha or story of Ram. On their way through a forest, Shiva saw Lord Rama searching for his wife Sita who had been kidnapped by Ravana, the King of Lanka. Lord Shiva bowed his head in reverence to Lord Rama. Sati was surprised by Lord Shiva.s behavior and inquired why he was paying obeisance to a mere mortal. Shiva informed Sati that Rama was an incarnation of Lord Vishnu. Sati, however, was not satisfied with the reply and Lord asked her to go and verify the truth for herself. Using her power to change forms, Sati took the form of Sita appeared before Rama. Lord Rama immediately recognized the true identity of the Goddess and asked, "Devi, why are you alone, where's Shiva?" At this, Sati realized the truth about Lord Ram. But, Sita was like a mother to Lord Shiva and since Sati took the form of Sita her status had changed. From that time, Shiva detached himself from her as a wife. Sati was sad with the change of attitude of Lord Shiva but she stayed on at Mount Kailash, the abode of Lord Shiva. Later, Sati's father Daksha organised a yagna, but did not invite Sati or Shiva as he had an altercation with Shiva in the court of Brahma. But, Sati who wanted to attend the Yagna, went even though Lord Shiva did not appreciate the idea. To hre great anguish, Daksha ignored her presence and did not even offer Prasad for Shiva. Sati felt humiliated and was struck with profound grief. She jumped into the Yagna fire and immolated herself. Lord Shiva became extremely furious when he heard the news of Sati's immolation. Carrying the body of Sati, Shiva began to perform Rudra Tandava or the dance of destruction and wiped out the kingdom of Daksha. Everybody was terrified as Shiva.s Tandava had the power to destroy the entire universe. In order to calm Lord Shiva, Vishnu severed Sati's body into 12 pieces and threw them on earth. It is said that wherever the pieces of Shakti.s body fell, there emerged a Shakti Peetha, including the Kamaroopa Kamakhya in Assam and the Vindhyavasini in UP. Lord Siva was now alone undertook rigorous penance and retired to the Himalayas. Sati took a re-birth as Parvati in the family of God Himalaya. She performed penance to break Shiva.s meditation and win his attention. It is said that Parvati, who found it hard to break Shiva.s meditation seeked help of Kamadeva - the God of Love and Passion. Kaamadeva asked Parvati to dance in front of Shiva. When Parvati danced, Kaamadeva shot his arrow of passion at Shiva breaking his penance. Shiva became extremely infuriated and opening his third eye that reduced Kaamadeva to ashes. It was only after Kamadeva.s wife Rati.s pleading that Lord Shiva agreed to revive Kaamadeva. What to do on mahashivaratri? Keep Fast (If possible). All night vigil. Chant "OM Namashshivaya" (written as OM NAMAH SHIVAYA but pronouced OM Namashshivaya) all night and pour milk, curd, honey, ghee, sugar, fruit juices, water to shiva linga. mypanchang.com will be performing full night lord shiva puja. Those who wants to take benefit can donate atleast $11/- to following charitable organization and email us your family member's names and nakshatra to us (archaka at mypanchang dot com) and we'll do sankalpa on your behalf. The last date to send us name is March 1st 2011. You don't need to send us the receipt. It's honor system. We'll take your word for it that you have donated money to those charities. Please send donation money directly to them and you keep the receipt (No need to send us receipt).